Saluda River Club has a new home in the desirable Village District available for immediate move-in. Located on lot 132, at 262 Waterstone Drive, the home is built according to a brand-new plan that emphasizes easy living, both indoors and out. This Lifestone Residential home measures 2,545 sq. ft., and offers three bedrooms and 2.5 baths. It is designed with traditional Southern aesthetic and convenient access to different areas of the home, including a master suite on the main floor and an additional room that would make a splendid office. A large outdoor patio is located on the side of the home. The large covered area is perfect for al fresco dining, even when it gets a bit cooler, thanks to a built-in fireplace feature. A 6’ masonry wall assures comfort and privacy. And to make living here even more attractive to busy homeowners, yard maintenance is taken care of in the Village District. Come see for yourselves: Step from the over-sized front porch into the generously laid-out home and admire its elegant 10’ ceilings, stunning hardwood floors throughout and custom moldings. The family room, featuring a cozy gas fireplace with decorative mantle, has double doors that overlook the private outside patio. It also opens to the dining room, a well-appointed and thoughtfully designed kitchen, and a screened porch that is perfect for some quiet time as well as entertaining friends and neighbors. The 2.5 car garage is also perfect for parking a golf cart. The kitchen features luxury stainless steel appliances with a gas cooktop in the huge granite-topped island, plenty of space in the custom cabinets, and a walk-in pantry. The laundry room, conveniently located on the main floor, has spacious built-in cabinets. The bright and spacious master bedroom features two windows overlooking the outside side patio, plus double doors separating the bedroom from the bathroom for privacy. The master bath features a large walk-in closet, water closet, corner soaking tub, separate vanities, tile shower, and linen closet. Upstairs you’ll find two additional bedrooms with a shared bath. 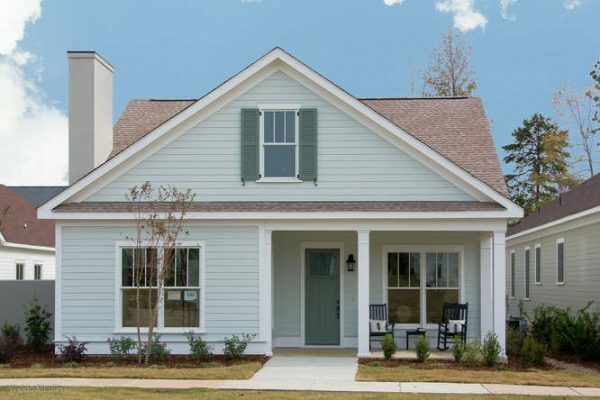 “This new patio home in the Village District has a lot to offer – in addition to its great location near Columbia,” says Lisa Smith, Marketing Manager for Saluda River Club. To learn more about this new homes in the Village District, and others currently available at Saluda River Club, please schedule a visit soon. For more information or directions, please call 803-358-3969 or visit www.saludariverclub.com.